About four years ago I began a love affair with Apple products that I had shunned up to that point. I am an IT consultant and project manager, but for the past few years I have been writing a lot of expert online content for software clients all over the world and helping them with marketing strategies in addition to the regular consulting and PM work. That said, my Macbook is my work...it is really my one and only work tool that I use day in and day out. To put things in perspective, I have written close to 3,000 articles on it for my clients - that's somewhere in the neighborhood of 1.8 million words. Since Amazon says the median length for all books is about 64,000 words...that's the equivalent of 28 books that I have written on this machine. Let's just say it is very important to me. Sorry Hon....I still love you, too (meant for my wife). It wasn't his fault...wasn't really mine either, but that's a long story. The baby bottle malfunctioned, but I should not have had it so close to my beloved Macbook anyway. At first everything worked fine. For about half a day. Then, ever so slowly, it began to malfunction. First a key or two. Then, different keys. Then all questionable keys at once. It was maddening....to say the least. Oh, and my Apple Care had expired, of course. So, I ordered a new replacement keyboard off of eBay for $15.88 (free shipping) watched a few YouTube videos to prepare myself and waited patiently for the keyboard to arrive. My keyboard finally arrived last Wednesday and I set aside Thursday morning to do the swap. Ha! I was hoping it would take an hour or so. I did a Windows laptop screen and hinge replacement during a project conference call a couple of years ago. Well, 8 hours later my Macbook was cleaned (of dust and residual baby formula) and running properly with a new keyboard in place. The collateral damage was two extra screws when I was done and a non-working internal microphone (I must have damaged the cable at some point or possibly left it disconnected...found out on a skype call with a client the next day). Was it easy? Not even close. I closed it up and re-opened it and fully disassembled it two more times because I couldn't get the screen to display anything at one point. Talk about a scary moment for me! But there is no way that I am going back in to try to fix the internal mic that I only use for those rare skype calls. I have an iPhone that will do just fine for those. You know how this goes. You are at a gathering – a party, church, a friend's wedding – and someone says, “What do you do?” How do you reply? “I’m a project manager” is just too broad these days. According to many job postings basically anything can be handled by a project manager. So what do you tell these people? Do you say, “A little bit of everything”? That would be accurate. And it definitely is for me as a consultant who is also a PM. But seriously…what do we do? You could say, “I solve problems creatively….all the time!” You could say, “I make tough decisions every day,” or “I resolve conflicts,” or “I manage headache-causing customers.” Or, “Whatever my director tells me to do.” Or even, in some organizations, “Anything I want to because they just leave me alone to manage the project.” All of these would/could be correct. Unfortunately, things don’t always go as planned on the projects we run as project managers. That easily goes without saying because we’ve all had projects that experienced bumps in the road or redirections at some point during the engagement. If it’s minor, then you can fairly easily redirect the project and activities, reassign things where necessary, make slight adjustments to the plan and budget, and be moving forward very quickly in the right, new direction. If the problem, issue, redirection, or project change is more major, then replanning is going to involve more extensive processes to make sure that you and project team have everything covered. If you find yourself in this situation, I have found that there are six key questions or actions to consider – basically as a checklist – to make sure you’ve covered all of your bases. After all, it can almost be like a mini (or major) restart on the project. You don’t want to miss some critical replanning process or task and have to deal with it later on. Every day there are increasing demands on project managers on the engagements they are managing…because everyone wants something. Project management can often feel like a people pleasing profession. Someone needs a decision quickly. This morning, the client needs a requirements change by tomorrow. A top executive needs a project status update by Friday. And your CFO needs a new budget forecast on your largest project by end of day today. Does any of this sound familiar? If not, you are one of the lucky ones. But we got into this position knowing this is how it would be…most of us did anyway. And there is no question that resource management on the projects that we manage can be one of the biggest sources of headaches that we encounter on each engagement. Everyone wants to know when you can free up a certain resource so that they can have that person for their project or so that their direct supervisor can have them back for a 3-week effort in between your project phases. Every new car – or concept car – introduced by manufacturers generates a buzz somewhere with someone. 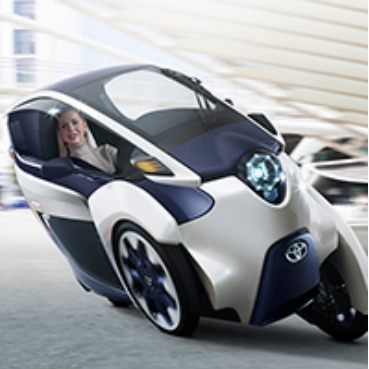 But I just got wind of the new Toyota i-Road single passenger vehicle recently and I think it deserves a good look. Part car, part motorcycle, I can't help but think how well this can work in today's situation of high gas prices, clogged roads, and full parking lots. Check out this video for an idea of what the i-Road experience is like. On March 2 of this year, an i-Road test drive event was held in Ecoful Town, Toyota City, Aichi Prefecture, Japan. The local residents who participated were all amazed at the new drive experience. First they needed a little initiation to the new driving experience, but then they were turned loose with the i-Road on public roads and felt total unity with the EV. All exclaimed it to be a truly exhilarating driving experience. The compact i-Road design EV is easy to handle, and it gives the driver the sensation of being at one with the machine as it speeds along narrow streets with ease. This new mobility style contributes to the alleviation of traffic congestion, minimizes parking space and helps to ensure clean cities thanks to low CO2 emissions. The all-electric Toyota i-Road has a range up to 31 miles, produces zero emissions while in operation with a lithium-ion battery, and requires roughly three hours to be charged. No special charging infrastructure is required, as it can use a standard household power outlet. The i-Road uses a pair of 2-kilowatt motors, mounted within the front wheels. It can travel up to 28 miles per hour and has an ultra-compact body that is ideal for urban maneuvering. At 7.7 feet in length, it is also easier to park in urban areas. The Toyota i-Road ultra compact EV attracted great attention at the Geneva International Motor Show and Tokyo Motor Show of 2013, and now it has made its debut on public roads. In Japan – and now France as well – it has been introduced as a "shared" driving experience…much like a bike rental system. I do think that, in the right market, it can catch on as a personal vehicle experience. The final word on whether or not this can become popular in the US will rely on safety, advertising, applicable driving and safety laws and regulations, and timing. Yes, timing…which based on Las Vegas' still "down" economy means that it needs to be priced right for the timing, or the timing needs to be just right for its introduction. One other obstacle at this point may be speed. While the small Iowa town I grew up in has speed limits of 25 miles per hour, most Vegas roads are 35-45 mph, making the i-Road's current top speed a potential problem. Searching for a new project management, task management, collaboration and information sharing enterprise tool? Look no further than Celoxis’ full-featured tool. Celoxis seems to have an unparalled focus on the project management community’s needs and they are continually striving to meet ever changing demands of the PMs and PMOs they service daily. Advanced Scheduling: Tasks are automatically scheduled based on resource work timings, time zones, holidays and work timings exceptions. It also supports inter-project dependencies. Project Portfolio Management: PPM is supported out of the box. But the user can customize it further using custom fields and charts. Resource Load Chart: This shows the standard information like resource load breakdown, utilization and conflicts. But it goes beyond that with its ability to solve conflicts on its own. This was a nice feature and it seemed to do a decent job at it, in my opinion. Workflow: This is an extremely sophisticated piece of software that allows you to create and track business process like bugs, client approvals, risks and change requests. Since change requests and client approvals are involved in 99% of the projects I manage, I found this feature very helpful. RSS feeds: This is particularly useful if you are a project manager and do not want to log on to the application to keep yourself updated. Unlike other some other products I’ve seen where RSS feeds are simply a list of projects or tasks, this RSS feed contains all the events that occur in projects. Custom fields including formula fields: Many types of custom fields are provided, each with its own validation rules to minimize data entry errors. There is even a “formula” field where you can enter your own formula. These fields can be used in report filters, columns and charts. I realize this is a fairly common feature but I felt it was worth mentioning as I create custom filters and reports on nearly every project I run (see next bullet). Custom Reporting: I found the reporting capabilities in the Celoxis product to be very detailed and customizable, which is very helpful to project managers like me who tend to want to use these reports to automate what they bring to the status reporting table with the client – making life a little simpler every week. Every view that you see whether it’s a gantt chart, a pie chart or a table, is a report. Even the dashboard is nothing but a collection of reports. To share data with your client, you create a report. User defined drill-down charts: This is something that executives and project managers should love. You can create your own graphical charts which automatically become 'clickable'. You can even use your custom fields as data sets. Supported types are pie, bar and bubble. I just wish the colors were a bit better. Interoperability with other systems: Today systems rarely exist in isolation and getting data in and out is a key requirement. Celoxis does quite well in this aspect. The API seemed simple and powerful. Data can be imported and exported in CSV. It also supports two-way synchronization with Microsoft Project. In addition you can do a number of things via email. Mobile interface: The mobile interface works on almost any smart phone, not just the iPhone. The interface is quite comprehensive and looks like a native iPhone application. You still get access to the same dashboard and reports that you would on your desktop browser. Client Collaboration: This is a great way to increase transparency with your clients. Depending on what you share (which, yes, you do have some control over), your clients can log on to Celoxis to view project reports, conduct online discussions, download project documents or participate in workflows. Celoxis has a sophisticated feature set, a wide array of customizations and was pretty easy to use. Support is excellent though there is no phone support. It is available in both hosted and on-premise versions. And you get all of this at an incredibly competitive price. From what I reviewed of the product, I would definitely recommend this software. Specifically, I highly recommend signing up for their 30-day free trial and testing it out on a project. For more information on the Celoxis product, visit their site. In Part 1 of this two part series on keeping track of your ongoing issues that arise on the projects you manage, we first had to acknowledge that every project experiences issues. It is the nature of project management and our imperfect environments that we can’t completely control. We then discussed a simple and usable format for creating and maintaining the ongoing issues list. Remember, making it too detailed and complicated will turn off the customer and confuse the very individuals that you are tasking to resolve the issues. Keep it simple and it will be easy for everyone to understand and for you to maintain, keep up to date, and distribute weekly. Project management success depends on your ability to track project status and communicate it effectively. Brad Egeland, a project consultant with 27 years of experience shares his success in using milestones in projects. He shares some tips and best practices as well as a compelling argument for the use of milestones and their impact on project success. Check out this informative PM video here.